Thurrock Marching Brass marched their way to the front of the Ockendon Centre to join local residents and the nation in celebrating Her Majesty the Queen’s official 90th birthday on Sunday 12 June 2016. With the British weather deciding to bring heavy rainfall in the morning, the young marching band were given a light but short reprise as the rain stopped for them to march their way from Deveron Gardens to outside the Ockendon Centre in South Ockendon, Essex, where an appreciative audience welcomed them. 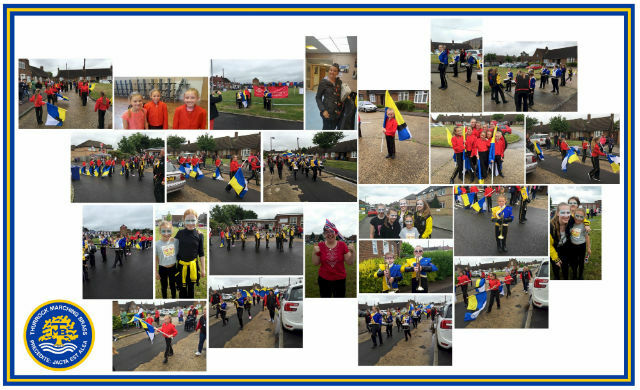 The organisers did a remarkable job in getting everything ready for the celebrations given the earlier challenges with the weather, and their true grit team spirit helped to make the day run well with many local youngsters involved in performances throughout the afternoon. Some staff members from Thurrock Marching Brass then joined the amazing High Voltage Big Band who entertained the crowds even further with a number of sets befitting the pomp and circumstance of such a magnificent milestone in British monarch history. It was clear that the weather was not going to spoil everyone’s fun and it was a great honour for the youngsters of Thurrock Marching Brass to march and perform on the day. Posted by News Editor on Tuesday, June 14th, 2016. Filed under Drum Corps U.K., FrontPage Feature.